It is that time of the year again when businesses everywhere are thinking of ways in which their brands can make the best out of this holiday shopping season and hence, it’s time for you also to figure out your holiday marketing strategy and celebrate in style. November and December drive 30% more eCommerce revenue than non-holiday months. This ‘make or break’ shopping period is an opportunity to put your best holiday marketing campaign ideas to use, and ready your business for growth. But, the good news is the high traffic and sheer volume of holiday sales and purchases also offer some incredible opportunities. By grabbing these opportunities you can attract, engage, delight and convert your shoppers into paying customers. Hence, it is important to have a robust holiday marketing plan. What should you incorporate in your Holiday Marketing Campaigns in 2018? The first step in developing any successful holiday marketing campaign for your eCommerce store is to identify your goals. If you don’t know why you’re launching a campaign or what you’re expecting from it, it’s virtually impossible to get anything out of it. 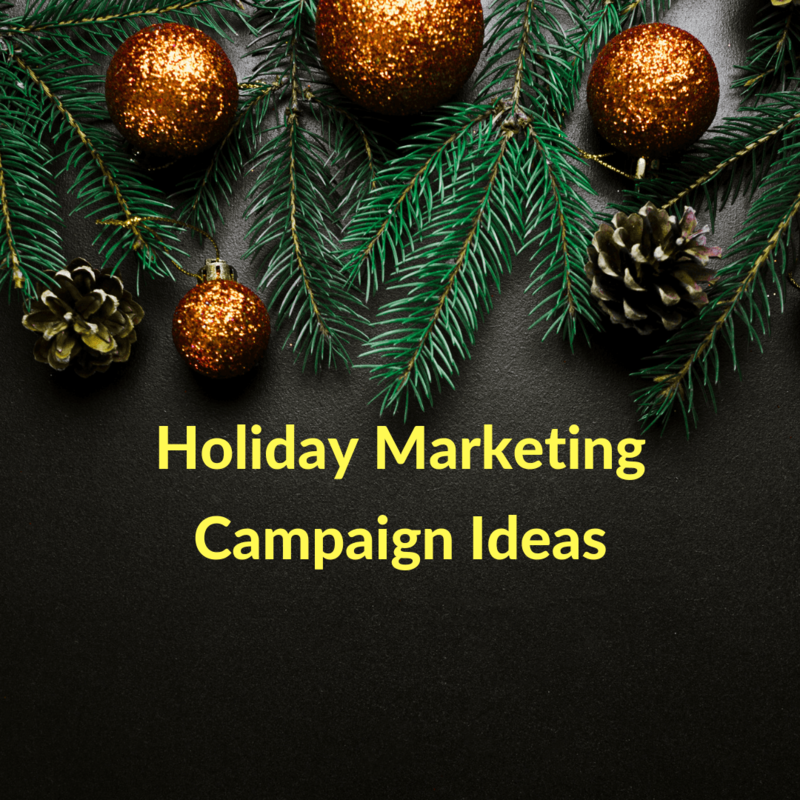 There are three key objectives that you should aim to achieve while designing your holiday marketing campaign ideas. Leverage the data collected in the process. Here are five holiday marketing campaign ideas to inspire your audience. It’s no news that customers these days expect a customized and personalized shopping experience – holidays or no holidays. From customized email marketing campaigns with the help of automated and personalized emails and recommending products based on their previous purchases, to personalizing the online store differently for each customer, personalization is everywhere. A vast majority of Millennial and Gen X shoppers expect online retailers to know their preferences and are willing to share personal information with these stores in order to save time and help them find the items they want without a glitch. 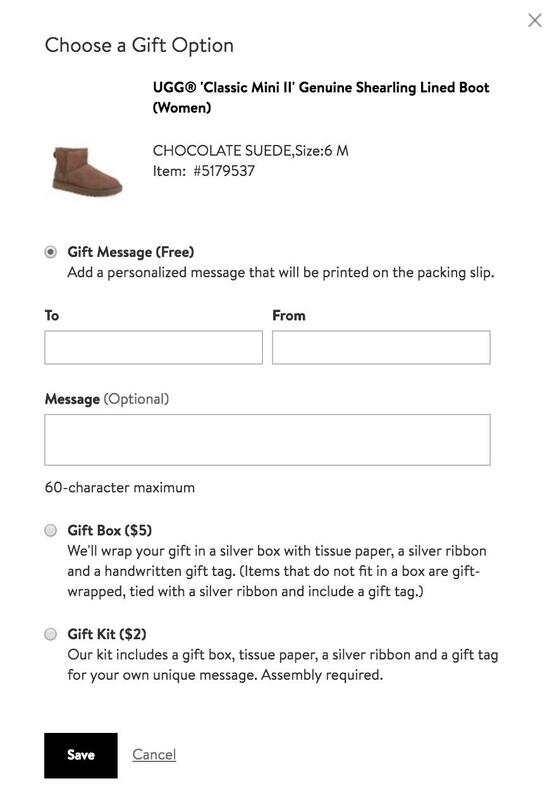 You could also run product personalization campaigns as a part of your holiday marketing plan. Your personalization campaign will vary depending on your consumer base and product offerings. For instance, Nordstrom allows its customers to include a personalized message with their gifts. For a small additional amount, they can also get the products gift wrapped in a box with a ribbon and a gift tag. You could also personalize your marketing messages to your customers this holiday season instead of sending the same message to everyone. For this, you need to look at the data for those customers who have bought from your store over the last 6 months and draw out a picture of the different segments of customers that buy from you. You can then send out an effective holiday marketing personalized message for each segment of these customers in the holiday sale season and draw them to your store. Use holiday marketing messages and holiday marketing phrases to make them turn to your store. You can also break through the stereotype by using customer data and order history to create personalized ads. If a particular customer’s order history shows that he had bought a wireless headphone three months ago, target them with ads promoting a holiday sale on headphones. Such an ad is more likely to get your shoppers’ attention rather than a generic headphone ad. Holiday social media marketing ideas and campaigns are a great way for brands and online stores to stand out from the competition and win customers. Here are a few great ways you can run these campaigns. With the Social Media advent calendar, you can showcase an exclusive piece of content to your fans and followers. This could be anything from flash sales, discounts, or you could even work with influencers to offer some photos or videos. This is the era of visual marketing and the latter has undoubtedly led businesses to raise the bar. In this holiday season, Christmas promotion ideas are nothing if they don’t involve a social media campaign where the marketing plan is aligned to visual channels like Instagram to draw in more customers. 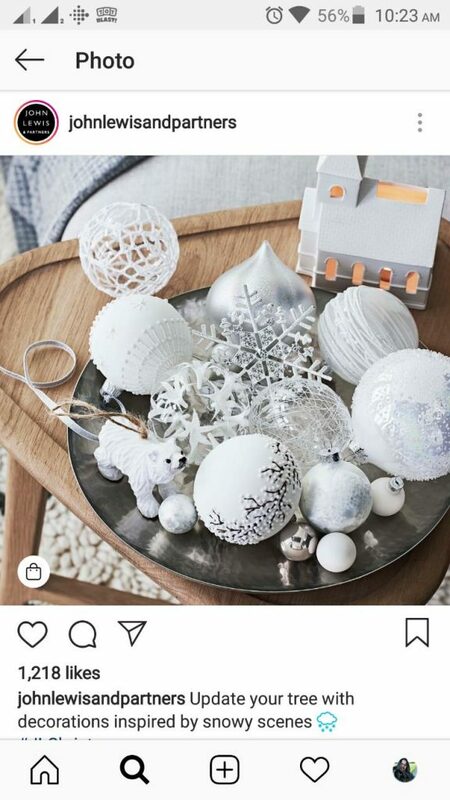 British retailer John Lewis has jingling along with each Instagram content reinforcing the sentiment of its #JohnLewisChristmas hashtag. 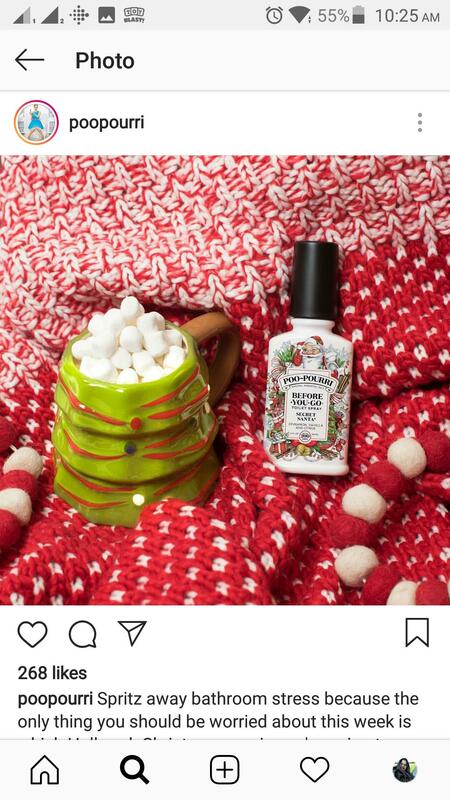 PooPourri, a bathroom spray brand has been nailing its holiday marketing campaigns on Instagram for some time now. 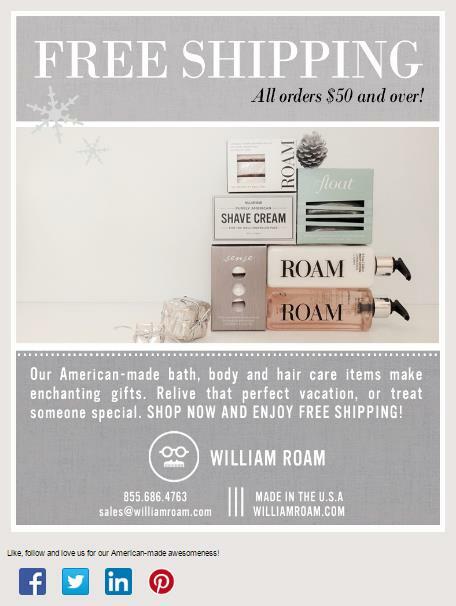 All their posts reinforce the product as the perfect Christmas gifting option. Go ahead and offer Social Media Only Holiday Discounts to your followers on platforms like Facebook and Instagram to make your social media audience feel a little more special this time of the year. This could be discounts, free shipping and much more. 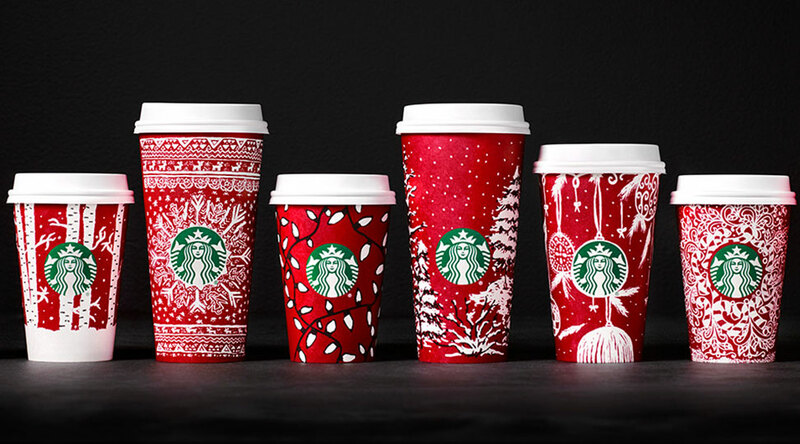 Starbucks came up with the ‘red cup’ campaign some time back. If you have a signature product, you could run a photo contest where your customers can get creative. It is a pretty simple promo to set up, and you’ll get a great brand visibility from it with people all over social media sharing content about your brand. The results of the ‘red cup’ campaign were simply overwhelming. Within the first two days after the launch of the campaign, a photo was uploaded to Instagram every 14 seconds. With a total of 40,000 entries, the #redcupcontest was a huge hit. These kinds of contests appeal to customers because it gets them an opportunity to feature on your social media pages, and it’s needless to say that it makes them feel special. 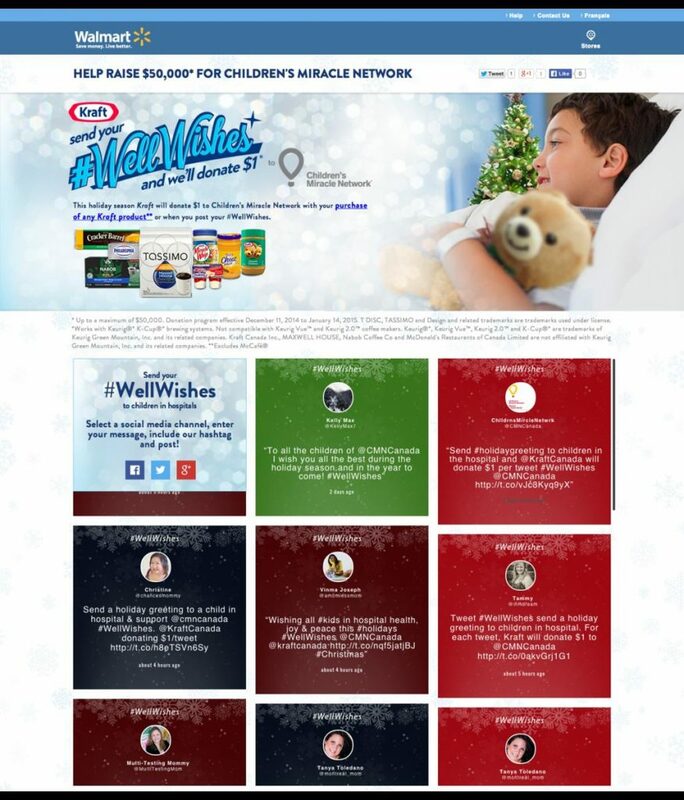 Walmart upped the ante when it launched their #WellWishes campaign. The campaign urged everyone to donate $1 to the Children’s Miracle Network with every purchase, while the hashtag was used for sending well wishes to children in need. 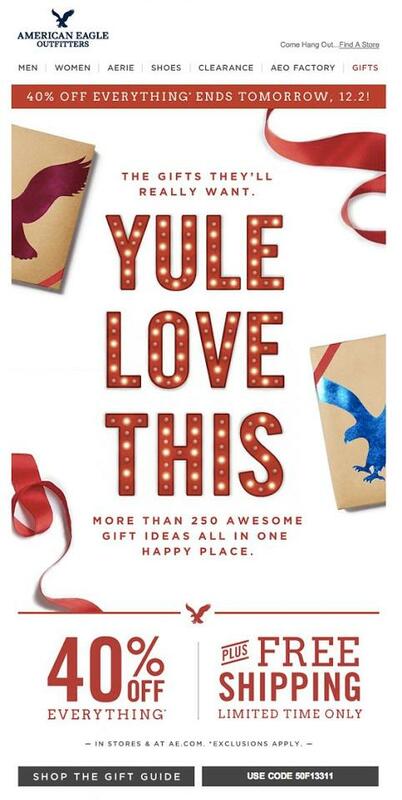 With this campaign, Walmart really managed to create a heart-warming campaign that spread the love at Christmas. People are happy during holidays and it also gives them an opportunity to spread their happiness by giving back to the community. 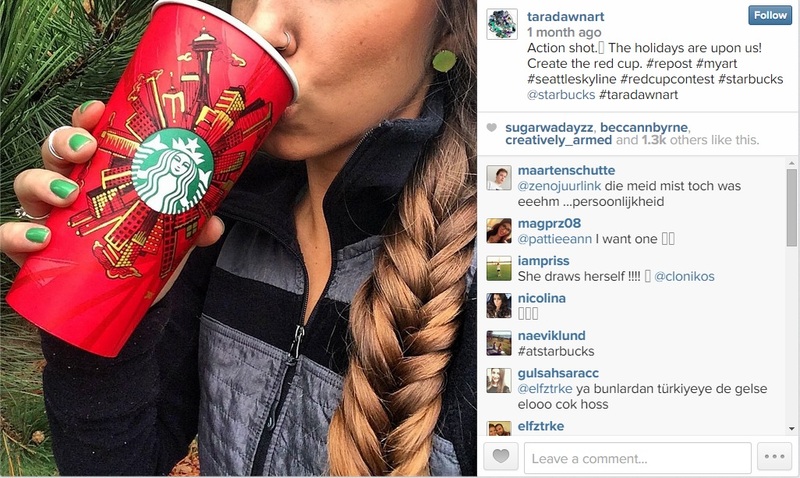 With social campaigns like this, as a part of your holiday social media marketing, your brand can also touch a nerve. It is now proven beyond a doubt that through emails you are reaching out to your highest engaged audience. Holiday email marketing campaigns are big drivers of the seasonal sales surge. According to Mailcharts, email marketing is responsible for 20% of holiday sales; which means, email marketing alone can bring in billions of dollars in revenue for businesses each year. There is no underestimating the fact that a simple good wish during this holiday season can be a warm gesture and enough to generate some positive feelings towards you at this time of the year. 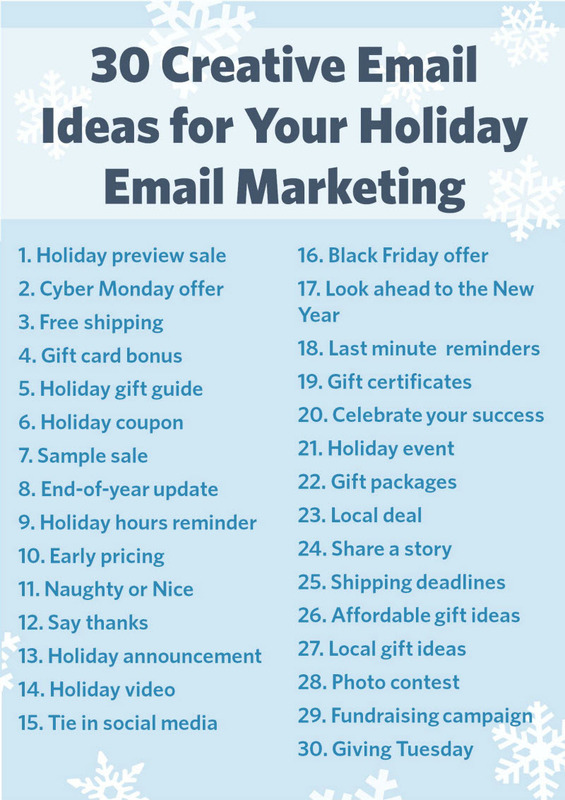 Make sure you have this in mind when crafting your holiday email marketing subject lines. Look at how SkullCandy designed its welcome mail. 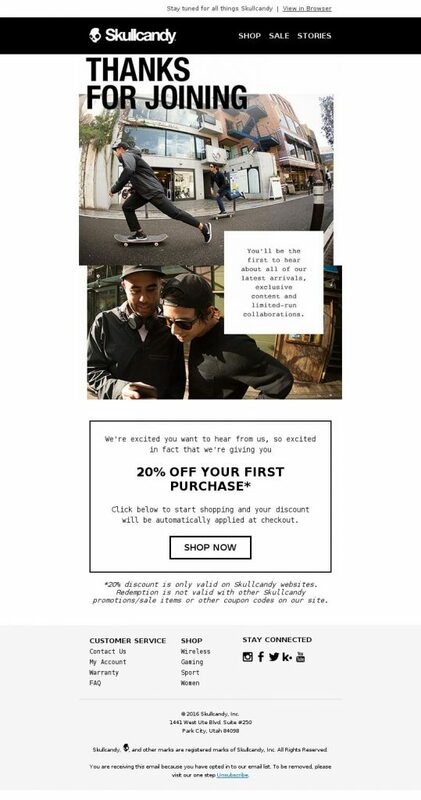 As a reciprocal gesture, the company gives its email subscribers a discount code for a future purchase. 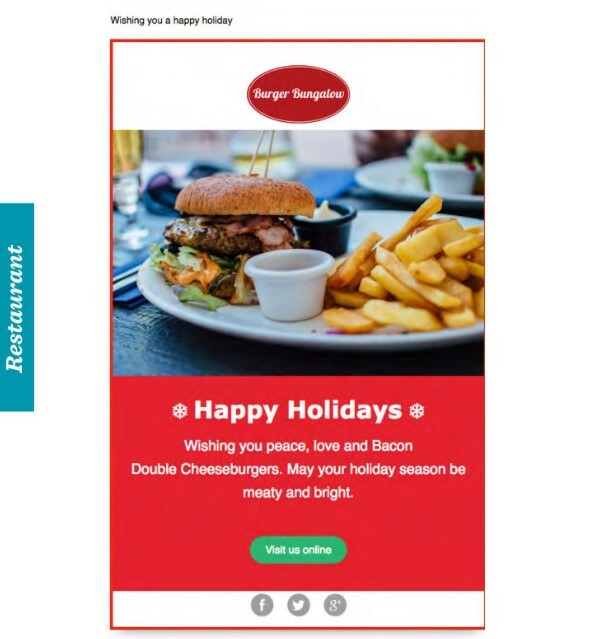 Burger Bungalow simply nailed it with their welcome mail by giving its subscribers a taste of their menu. 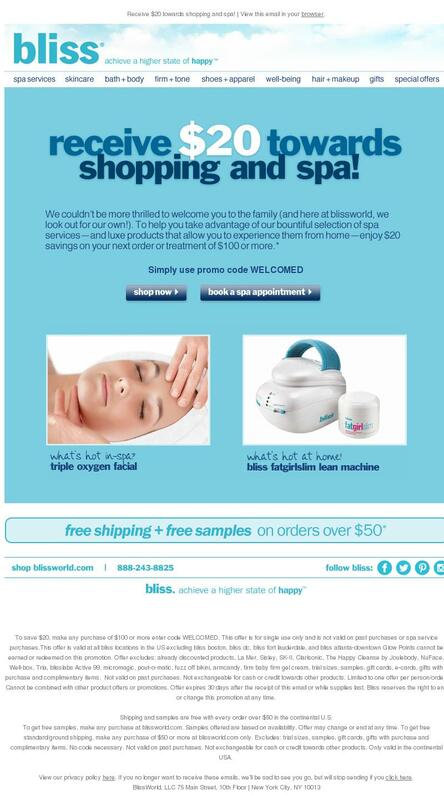 Here’s another great example of how Bliss effectively used their welcome email. The welcome email is sent with not only a great subject line that reads – An exclusive offer for new subscribers; but also offers a gift in return for repeat subscribers. There also is a soft call-to-action that all orders over $50 will get free shipping and samples, which by the way, is a great reason to make use of the $20 credit they just received. Shipping information (including final delivery dates). Gift card and voucher options. Let’s look at how Jeni’s Ice Creams did last year. 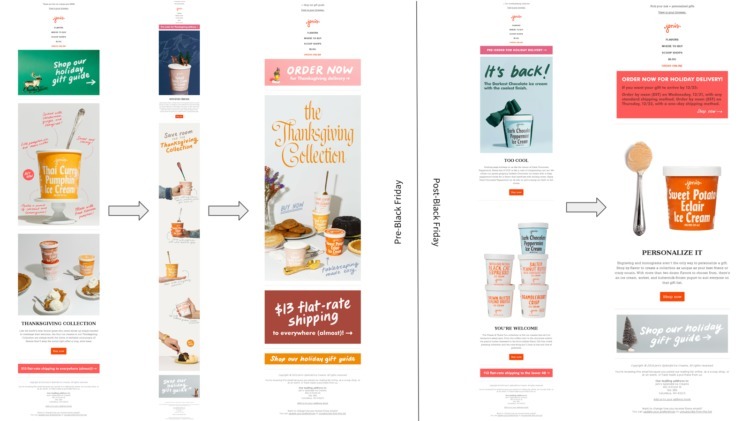 Their holiday email marketing campaign was a clear campaign launch with a CTA to shop a holiday gift guide. There were some fun graphics which was bound to appeal to their customers and an additional CTA for a Thanksgiving delivery. There were clear CTAs everywhere in the emails. American Eagle Outfitters used some word play in the example below to put their message across. It clearly demonstrates that having some fun was a part of their holiday marketing strategy. Gone in a Flash created a Christmas marketing campaign image that was immediately understood and was relatable. 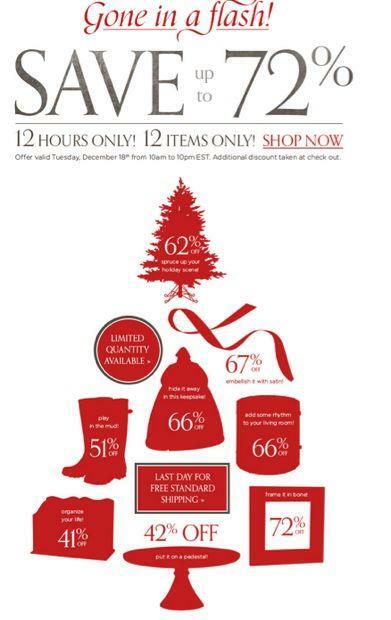 It takes a few seconds to see what’s on sale and by how much – all with a Christmas theme. 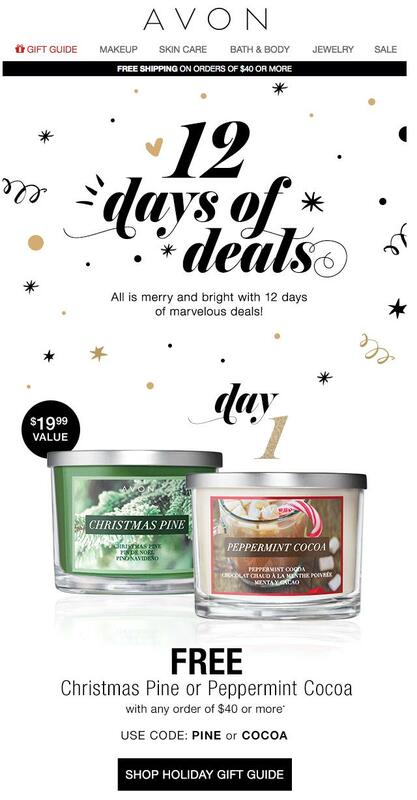 Avon on the other hand jumped into the holiday marketing campaign bandwagon by coming up with 12 promotions, one for each day of the Christmas calendar. Each promo lasts for a short time, but it’s a great way to create urgency, keep their customers interested and waiting to see what comes next! An eCommerce business doesn’t always have to be about packing your emails with only sale-oriented content. You can also use these holiday promotions to grow and enhance your image, inspire customers or share useful product information that can help customers plan the ideal holiday this Christmas. Take Food52 for example. They had kept things rather simple and on-message with their COOK(IE) NOW CTA. This is a great example of an educative message while staying true to the brand image. 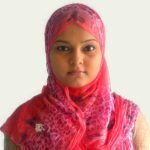 For these, it is crucial that you trigger automated abandoned cart emails addressing their specific problems. Apart from that, offering free or lower shipping is one way to reduce cart abandonment, especially during the holiday season. Create scarcity of the product your customers are leaving in their carts. “Back-in-stock” messages also tell them that this item often isn’t in stock. Try and spruce up your holiday email marketing campaign with user-generated content like photos and testimonials. This way you will remind your customers that they are a part of your brand. This time of the year people usually scour the internet for Christmas presents and gifts for friends and family. With a spike in this demand for different products, it is a great opportunity to dive straight into the paid digital marketing space to benefit from the holiday season marketing. You have access to multiple avenues you could go down, with Google AdWords topping the list. Google AdWords allow you to promote your business through Google platforms and services. There are other options which include Facebook ads, Twitter advertising and Instagram ads. On most of these platforms, you will have the freedom to set budget limits, as a result of which the power to control, monitor and focus the ad campaigns in a specific direction will be with you. One such Christmas campaign that you could run as a part of Christmas promotion with paid digital advertising is the Google search network campaign which help you show off your Christmas offers. Identify your most loyal customers and send them an exclusive offer to help them shop before others. Identify those contacts who leave your site without placing an order and offer them a special Christmas promotion to win them back. Target those paying customers who are regularly visiting your site with appropriate offers. Prepare a holiday referral program that promises to reward customers who share your brand with their friends. Send a ‘Thank You’ email at the end of the year to all those customers who have purchased from your site through the year. Use social media scheduling and monitoring tools to stay on top of your social media Christmas campaigns. Use new technologies like streaming videos or Instagram Stories this holiday season. Make sure your website loading time is optimized during the holiday season, considering that traffic will be high. Help your customers choose the perfect gift, guarantee on time delivery, or offer gift wrapping. These are little gestures which go a long way. Apply holiday marketing themes to your social media pages and cook up some holiday season marketing slogans too that you can use in your emails and messages. So, get set and be merry! The holiday season is a time for fun, frolic, sharing and enjoyment. And your holiday marketing campaign ideas should also reflect just that. This season not only gives brands a chance to do something different, but also gives them an opportunity to involve their fans and customers in all the action. Out of all the things that I love about these holiday marketing campaigns, is the fact that they put the fun back in holidays. From our family to yours, Happy Holidays!